A record number of women are running for office. How are they faring so far? WASHINGTON — One of the biggest stories of this midterm cycle is the record number of women — particularly Democratic women — who are running for political office. So, how are they faring so far? After two primaries this month — in Illinois and in Texas (which holds primary runoffs if no candidate gets to at least 50 percent) — out of a total of 67 female House candidates, 35 either won their primaries outright or will compete in a runoff on May 22, according to the Center for American Women and Politics. That’s about half. The win rate is higher for Democrats, who have more female candidates running for the House overall but also saw greater success rates; 31 of 54 Democratic women in the two states either won or advanced, compared to just four of 13 Republican female House candidates. Here’s a rundown of some of the highlights from female candidates in Illinois and Texas. Women will appear on the general election ballot in two of Illinois’s closely watched congressional races in the fall. Lauren Underwood handily won the Democratic primary to run against Randy Hultgren, while Betsy Dirksen Londrigan will face off against Republican Rodney Davis. Both are seats where Republicans are favored but that Democrats have a shot to turn blue. But one of the state’s most vulnerable Republicans, Peter Roskam, will face another man in the general election after scientist Sean Casten narrowly won the primary against Emily’s List favorite Kelly Mazeski. No Republican women were on the primary ballot for an Illinois House seat, although GOP gubernatorial challenger Jeanne Ives lost a closer-than-expected contest against incumbent Bruce Rauner. Two female candidates made the runoff in the state’s most contentious Democratic race —Lizzie Pannill Fletcher and Laura Moser, whose past comments about a town in Texas led the DCCC to publicly oppose her bid. The winner of that contest on May 22 will face Republican John Culberson in what could be Democrats’ best shot at a House pickup in the state. Democratic women also made the runoffs to compete against vulnerable Republicans Will Hurd and Pete Sessions. Dem gubernatorial candidate Lupe Valdez, who would face a longshot general election bid against incumbent Greg Abbott, is also headed to a May runoff. 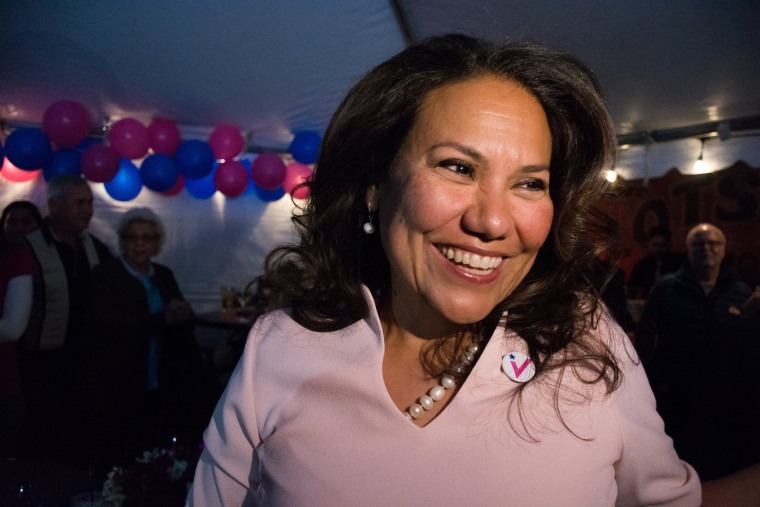 And with their primary wins in two open Democratic seats, the state is poised to send its first two Latinas —Veronica Escobar and Sylvia Garcia — to Congress. On the Republican side, female candidates made the runoffs in crowded primaries in a solid red district (to replace retiring Rep. Jeb Hensarling) and a solid blue one (to replace retiring Rep. Gene Green), but fell short in the GOP’s most crowded and contentious primary in TX-21. By taking up the pair of cases (one, by the way, in which gerrymandering benefitted Republicans and one in which it benefitted Democrats), the court has seemed to signal that it’s finally ready to weigh in on an issue they’ve previously stayed away from — and one with huge potential consequences for American politics. The justice to watch in today’s oral arguments, by the way? Anthony Kennedy, who gave the deciding vote in 2004 that kept the court out of partisan gerrymandering for the time being, even while saying he was open to revisiting the issue. Plenty of folks have noted that, for a former reality star whose catchphrase was “you’re fired,” President Trump has been notably averse to announcing personnel changes quickly and decisively. VA chief David Shulkin, who has been subject to rumors of his dismissal for weeks but has not yet been fired, is the latest example. After his ouster seemed imminent at the beginning of the week, Shulkin is still on the job even as the White House has — at best — sent mixed messages about his future. Part of the reason for the delay, by the way, is that there isn’t a clear replacement for Shulkin, and the pick could face a difficult confirmation hearing. But Trump’s habit of leaving members of his own team twisting in the wind for days, weeks or even months on end (see: Tillerson, Rex), also means that the sprawling government agencies that they lead are also left in limbo, wondering at any given moment who — if anyone — is in charge. And meanwhile, on the other side of the globe, things are unfolding fast in the global situation with North Korea after Kim Jong Un made a secretive “unofficial” trip to China to meet with Chinese President Xi Jinping this week. The meeting seemed engineered to send the message that China and North Korea are soothing their strained relationship, and that China will assert itself as a key player in any nuclear agreement. But analysts say that if the longstanding tensions between Beijing and Pyongyang have indeed eased, the United States would certainly have a weaker hand in the negotiations. So the question is: How does the Trump administration respond to the very complex, very fast-moving developments here? And finally, here’s the latest this morning in the Stormy Daniels case. Daniels attorney Michael Avenatti has asked to depose the president and his lawyer, Michael Cohen, over the $130,000 payment that was issued eleven days before the 2016 election.